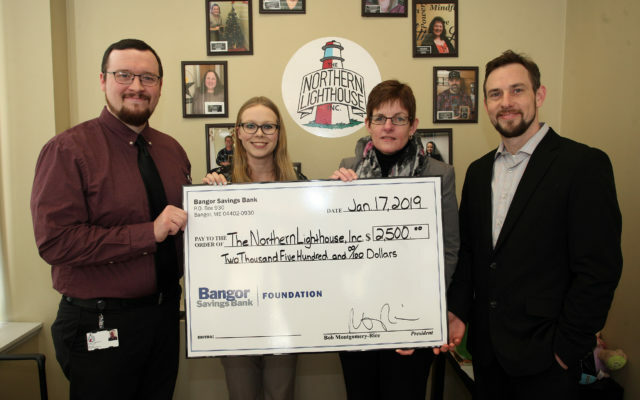 Staff at the Northern Lighthouse, a nonprofit organization that provides a wide variety of mental health services, will soon have access to better technology for their clients thanks to a grant from Bangor Savings Bank. HOULTON, Maine — Staff at the Northern Lighthouse, a nonprofit organization that provides a wide variety of mental health services, will soon have access to better technology for their clients thanks to a grant from Bangor Savings Bank. The bank’s foundation awarded a $2,500 grant to Northern Lighthouse to purchase electronic tablets for direct care staff who work with children with intellectual disabilities such as autism. Hatt said the tablets could be used to provide a more “mainstream approach” to identifying areas in which students may be struggling on a daily or weekly basis. According to Christine Nickerson, senior relationship manager at Bangor Savings Bank, the award was part of a quarterly review of applications for funds the bank received. The Northern Lighthouse is one of the largest outpatient therapy departments in Aroostook County, with 12 certified therapists able to provide care for adults and children with mental and behavioral disabilities. The organization has locations in Presque Isle, Mars Hill, Caribou, Waterville and Houlton. For more information, visit the organization’s website: http://tnlh.org/.